Great picture that caught my eye on Stoat’s blog, taken by him at St. Pancras station, rather sums up some of the UK youth quite well. 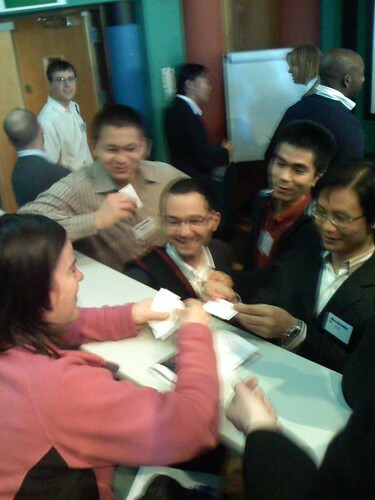 Meanwhile here is a different perspective on the UK taken at The Judge Business school where aspiring MBA’s are grabbing business cards from the Google girl (Alison Parrin) at the recent Silicon Valley Connects event. Where we heard such gems as a MBA is a waste of time if you want to be an entrepreneur and that anything learnt as a management consultant will have to be un-learnt and my favourite were all the flying analogies in starting up companies such as Reid Hoffmans:- Starting a company is like jumping of a cliff and assembling an aeroplane on the way down with financing providing a thermal draught!